So,….the diesel heater saga continues. A new control box was overnighted from Seattle and arrived to Sidney noon Friday. Philbrooks quickly did the install and we said our goodbyes for the second time. Before we could even push away from the docks, the heater failed again. Now what? 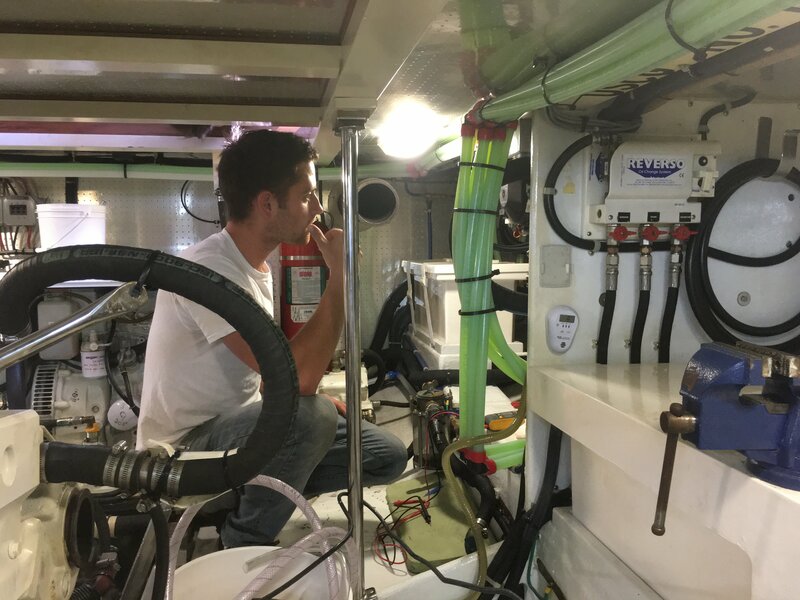 Nick, the electrician, spent another hour in the engine room taking voltage measurements. Everything seems fine. We now think it must be a fuel delivery issue but that will have to wait until Monday as it’s 4:30 on a Friday afternoon and everyone is ready for the weekend. 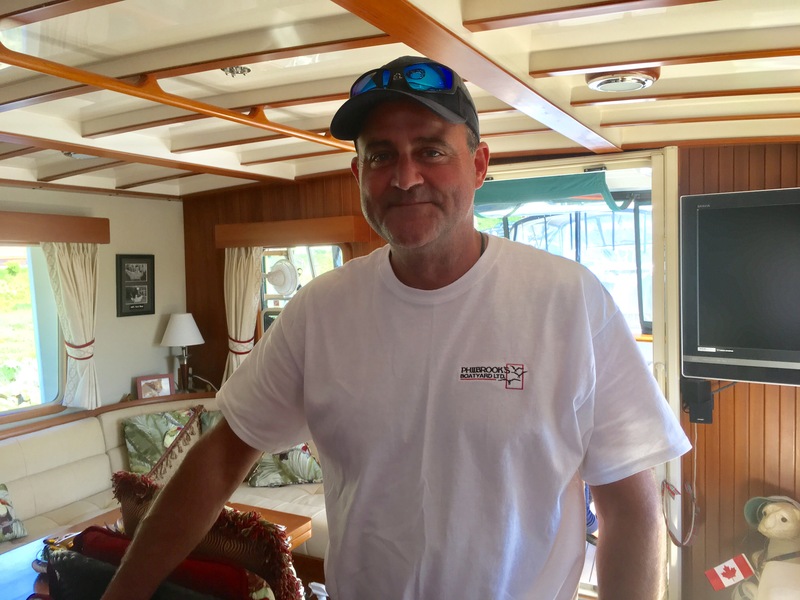 Ian, the project manager at Philbrooks, suggest we cruise to Saturna Island for the weekend. Being only 20 miles away, we can be back here Monday A.M. for a second conference call with the manufacturer. 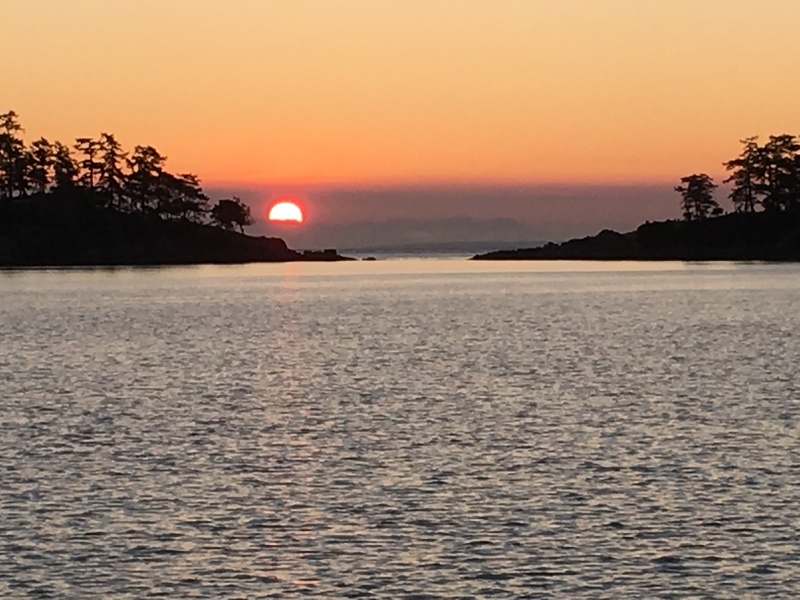 It is a beautiful two hour cruise out to Saturna Island. Minx Shoal marks the entrance into Winter Harbor, our anchorage for the next few nights. We make sure to travel well past the shoal before making our turn into the harbor. With 10 foot tides, part of the shoal is underwater at high tide. We have heard several horror stories of boats running aground on the shoal. Winter cove is a nice anchorage with Islands on three sides to block the winds. There are 12 other boats already in the anchorage. Ian has good friends on the island and had said we should anchor just off their house and use their docks for going ashore. There are signs on both banks warning against anchoring here due to an underwater cable and our charts also are marked with an underwater cable. Normally we would never anchor here but Ian assured us there is no cable. I am not so trusting but Jeff insist that if Ian says “no cable” there is no cable. Guess we will see what happens when we haul up the anchor. Saturna is a wonderful little island. 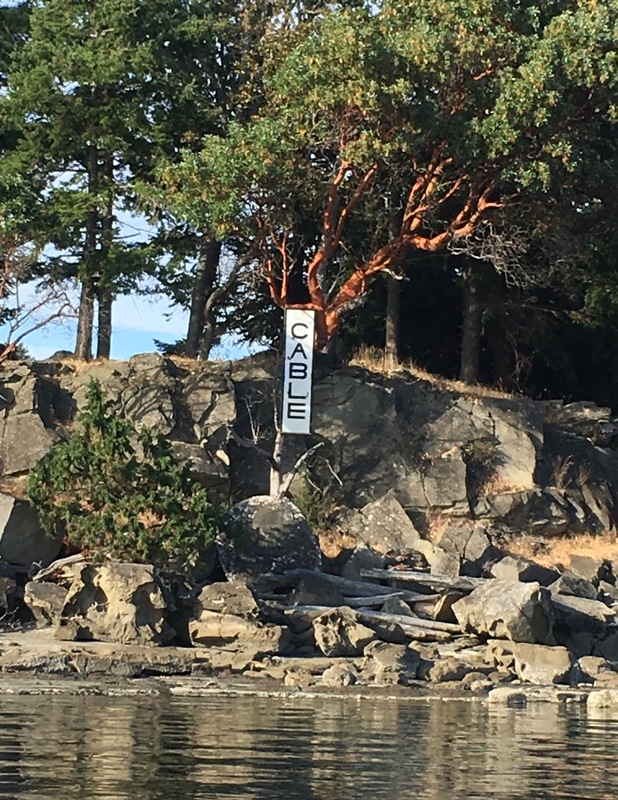 There are about 350 permanent residents who call this Gulf Island their home. Over half of the island is undeveloped as it is part of the Gulf Island National Park. The BC ferry makes several stops here each day along with float plane service from Vancouver three times daily. There is one general store which also houses the local post office. Being only five miles from the anchorage, we make that our destination Saturday morning as the local market is held there each Saturday. 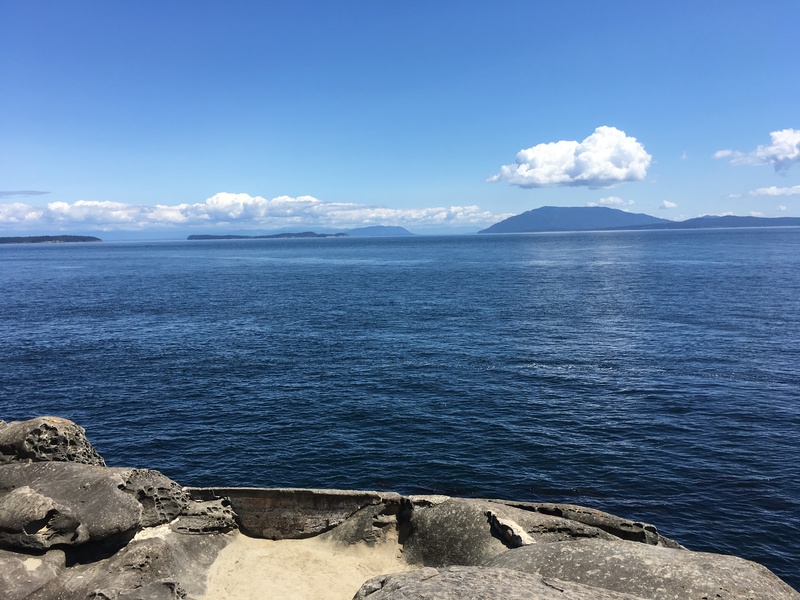 From some of our previous island biking adventures, we have learned that the phrase “somewhat hilly” on the Gulf Islands means leg busting climbs. Today’s ride was even more strenuous than expected. After three mountainous climbs we finally reached the General Store. 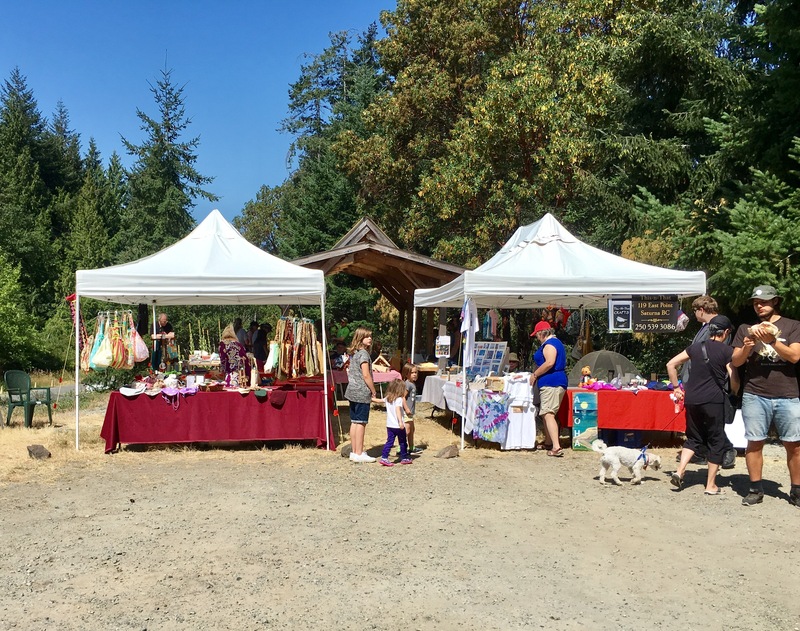 The Saturday Market was in full swing. 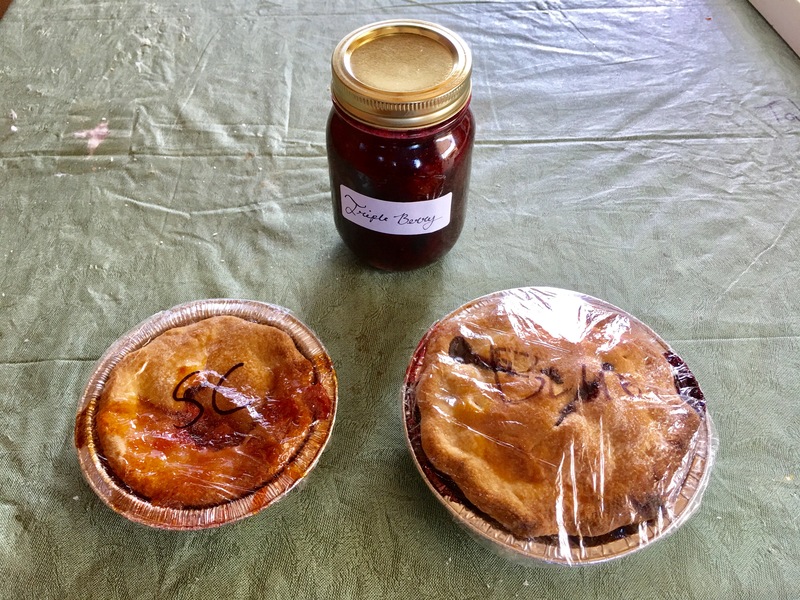 It was a small two tent affair but we did procure some really good homemade blueberry and cherry pies along with some homemade jam. Their homemade cinnamon rolls are not to be missed either. Our next stop was another long downhill to the ferry. 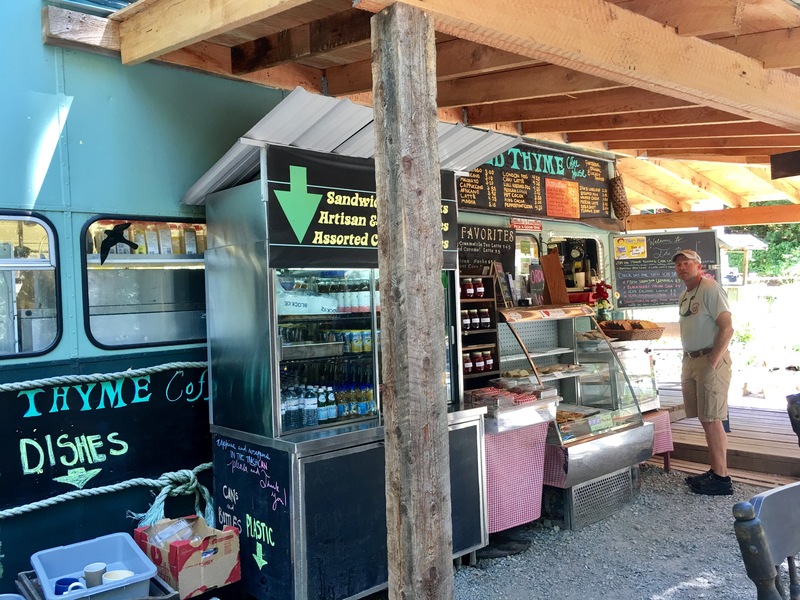 Wild Thyme Coffee Shop is a local favorite located next to the ferry. Layla the owner of this converted British double decker tour buss has been operating the coffee stand here for 18 years. 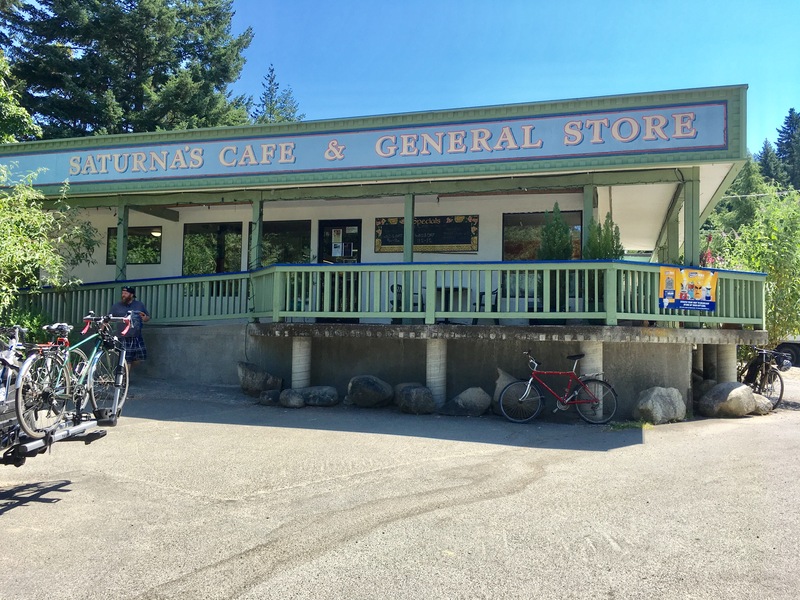 The General Store, the Pub, and this coffee stand are the only eating establishments on the island. We took the dinghy out one afternoon to set our crab traps. We only saw a few other crab traps out and they were all set in about 80 feet of water. So we placed ours in the same vicinity. 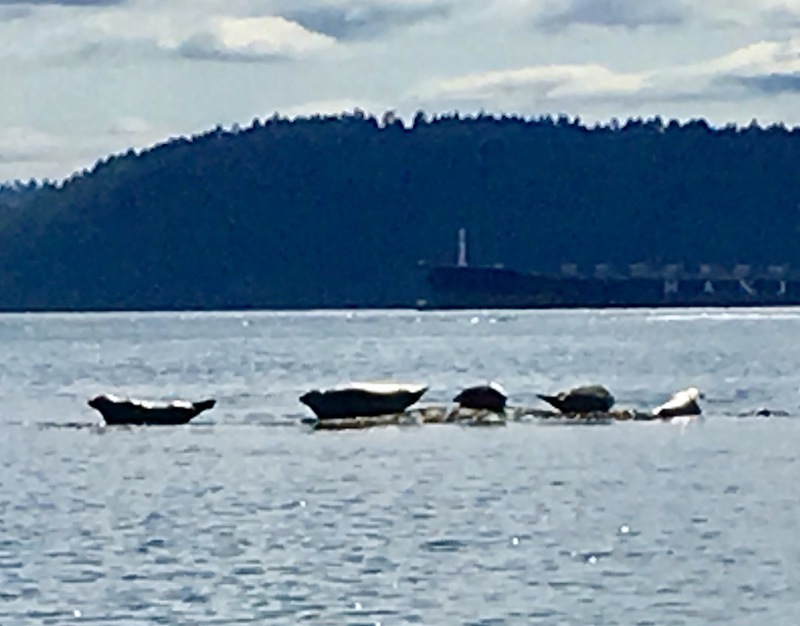 It is low tide and the seals are sunning themselves on Minx Shoal. 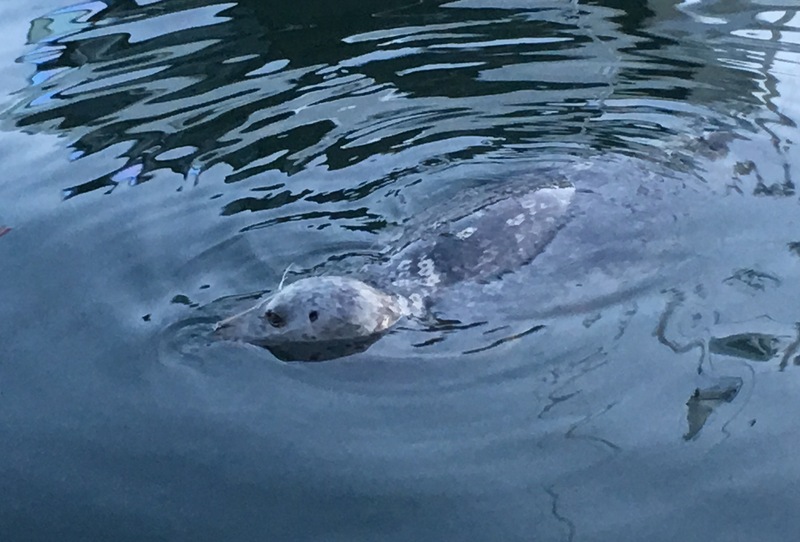 We see them in the harbor several times each day as they make their rounds looking for food. After two hours, we head out in the dinghy to retrieve our traps. We were worried about loosing them into deeper water with these strong currents. Both traps are still there but unfortunately only a few Rock Crabs are in each trap so we let them go. Some people have told us that they do keep the Rock Crabs so maybe we will give them a try next time. Sunday morning we meet up with Ian’s friends, Melanie and Dave, who have a beautiful home on the island. It is great getting to know them as they are very experienced sailors. They take us on a wonderful 15 mile bike ride out to East Point. The scenery from the high bluffs is amazing. 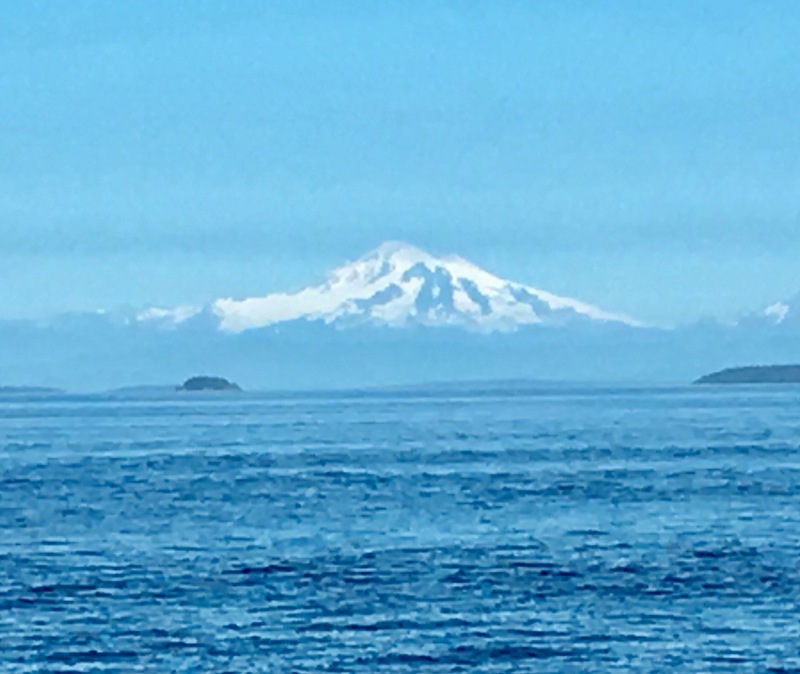 From here you can see the San Juan Islands as well as many of the Gulf Islands. The whales are frequently seen passing by just offshore. Talking with one of the researchers, we learn that a transient pod was seen just yesterday. It is interesting to learn that the transient whales eat the seals while the resident pods do not. The resident whales only eat salmon. Isn’t Mother Nature smart. 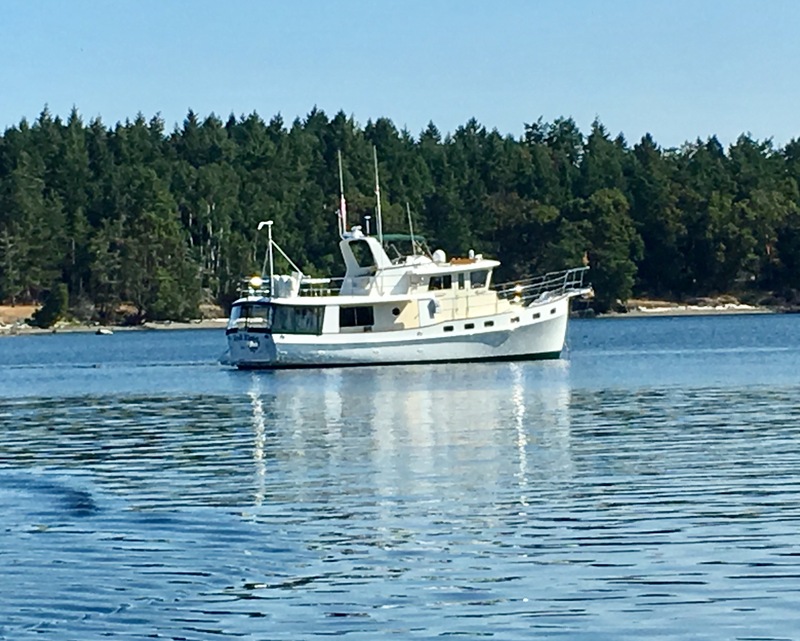 Our stay on Saturna Island was shortened so that we could be back to Philbrooks Monday AM for more diesel heater troubleshooting. We pull anchor just as the sun is rising above Boat Pass. And no we did not hook any cable. Looks like Ian was correct, there is no cable. The signs are kept there so boaters like us will not anchor in front of their homes. So, we are soon back in Sidney with more conference calls and troubleshooting. And of course the heater works flawlessly once again. We run it all day and night and it works perfectly. OK, maybe something was loose and while inspecting the heater it was tightened up. We say our goodbyes once again to all the Philbrooks crew. The plan was to anchor out at Sidney Spit just three miles away for the night. Well…20 minutes later as we approach our anchorage the heater quits once again. Another call is made to Ian at Philbrooks. After more calls to the manufacturer, we head back to the marina. Nick and Ryan are soon aboard for more tests. We now think our fuel solenoid is bad. One is being overnighted along with several other possible culprits. We have named our heater Puff The Magic Dragon because ever once in awhile a white Puff of smoke is emitted from the exhaust and the heater requires magic to keep it running. When operating properly, the heater sounds like a small dragon when it ignites. 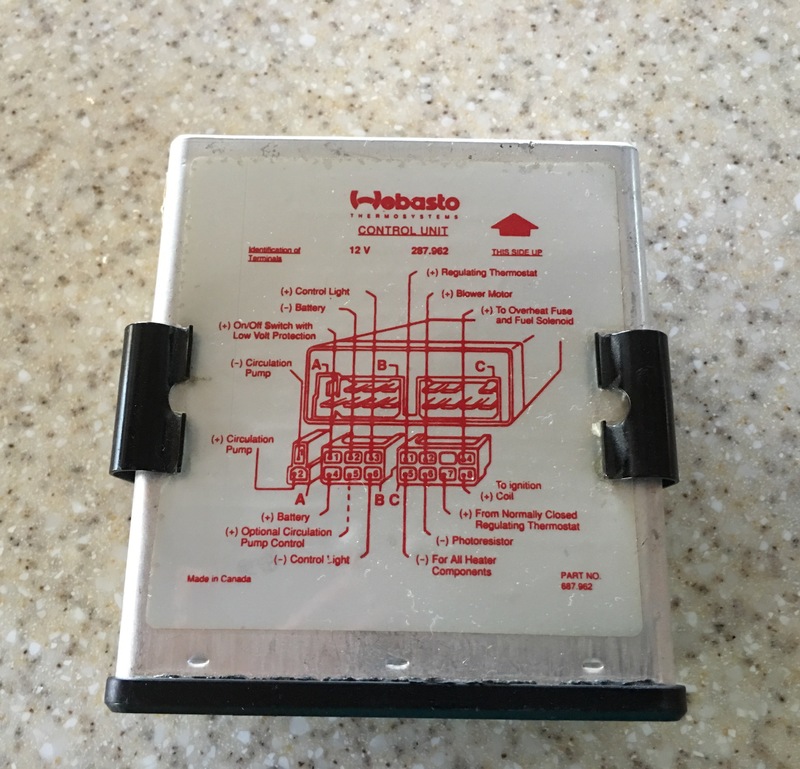 We are keeping our fingers crossed that this new solenoid is the answer. We have enjoyed our time at Philbrooks but it is time to start heading north. This entry was posted on July 20, 2017 at 7:19 pm. You can follow any responses to this entry through the RSS 2.0 feed. You can leave a response, or trackback from your own site.